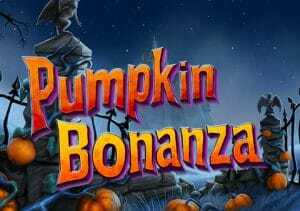 Brave a haunted house and you could win big in Pumpkin Bonanza, a Halloween-themed video slot from Playtech. The action takes place on a 5 reel, 10 payline, win both ways game engine. Land a win in both directions and you could trigger a wild reel or better still a Bonanza Spin where loads of extra wilds are added. Play on the your PC, tablet or mobile from between 10p and £500 per spin. Playtech has created a very well-designed video slot here. A haunted house shrouded in mist is the setting. On the reels are lower value playing card suit symbols. They’re joined by a scarecrow, who looks like he’s been treated by Dr Frankenstein, and a smiling witch. The witch on her broomstick is the best payer, awarding 5, 20 or 50 times your bet if you land 3, 4 or 5 on a payline. Pumpkin Bonanza looks very straightforward, but the gameplay is a little unusual. There are 2 extras to keep an eye on. If you land a spin that could result in a win from both left to right and right to left then you could benefit from a Pumpkin Wild. Potential winning symbols on reel 3 turn into pumpkin wilds to deliver the win both ways combinations. For example, if you land 2 scarecrows on reels 1 and 2 and a pair of spade symbols on reels 4 and 5 you could have a win in both directions if the middle reel falls nicely. The pumpkin wild on reel 3 can deliver that win. After a spin with win both ways combinations, you’ll be in line for the Bonanza Spin feature. Winning symbols from the triggering spin on the middle 3 reels have the potential to turn wild and create a new winning combination. With a respin granted, wilds can land on reels 1 and 5 for even bigger wins. The extras on offer in Pumpkin Bonanza are a little unusual. We recommend having a go in demo mode before you start investing your hard earned. If you’re after traditional extras like free spins and pick me rounds, then you’ll have to look elsewhere. What Pumpkin Bonanza does offer is high spec visuals, a cracking backing track and unusual wild extras. It’s not something we’ll be racing back to but the prospect of payouts of 2,000 times your bet from a single spin should pique your interest if you enjoy the horror theme. I also suggest you try the superb Halloween Fortune (by Playtech) which still remains a firm favourite.